On Mariposa Street, just east of Potrero Avenue. This one-block slope is at the beginning of my Friday evening walk from KQED to the Ferry Building. From that stop sign up above, I turn right, then cross U.S. 101 on the pedestrian overpass that connects to 18th Street on the east side of the freeway. One more block up from there is Kansas Street, a corner with one of the great views of downtown. From there, I walk north and east down the slope of Potrero Hill and across the South of Market flats to the Bay, sometimes walking over the low eminence of Rincon Hill. What I noticed most about the walk this week: It’s getting dark much earlier than it did just a month ago. Update (January 2013): Here's a fresh post, by a French blogger, recounting the history of "Bicycle Wheel," Duchamp, and the many iterations of this work: "A Hundred Years Ago: 'Bicycle Wheel,' by Marcel Duchamp." A few days ago, I was looking for an online image of a bicycle wheel that I could use as a Twitter icon. Talk about having a high purpose. I happened upon a Museum of Modern Art image of "Bicycle Wheel," a found or "readymade" art object by French artist Marcel Duchamp. It's a sweet and goofy construction: a bicycle wheel and fork mounted upside-down on a tall stool. Many aspects of a bike lend themselves to wonder and introspection–everything from the the double-triangle frame design to the bearings and races in a hub–but the wheel ranks right up there at the top with its combination of fragility and strength. Duchamp is said to have enjoyed spinning his stool-mounted wheel and is widely quoted as saying, ""I enjoyed looking at it, just as I enjoy looking at the flames dancing in a fireplace." The MoMa site has a nice picture of one of the three Bicycle Wheel constructions Duchamp is said to have made The first of the three Bicycle Wheels, dated in 1913, was "lost." The MoMa wheel is dated 1951, is said to be the thirdand features a classic raked-forward fork. The way it's presented on the site, there's no question it's an objet d'arte. (The version pictured here appears to be the same sculpture; it's uncredited and found here. I'm seeking permission to publish the MoMa's image here; we'll see if I get it). Below is another another Duchamp "Bicycle Wheel" that appears (with no copyright notices) here and there on the Web (this image is from Wikicommons). The source says "replica," but I believe that refers to the fact it's a Duchamp copy of the lost original. What I love about dipping into something like this is the impromptu museum tour that happens. "Bicycle Wheel" in MoMa: check. Another version in some other exhibition: check. The next stop is (if picture captions are to be believed) is Duchamp's studio a few years after he first put wheel and stool together. There it is, the object pre-veneration, the wheel askew, apparently just part of the disarray in an artist's quarters. You can appreciate the inspiration and the execution–and the suggestion the creator apparently didn't take it too seriously. All of which brings us to our final display: the continuing life of "Bicycle Wheel" outside the gallery. For starters, we have the creation of "The Duchamp," a found musical instrument. And this alternate take on the concept. 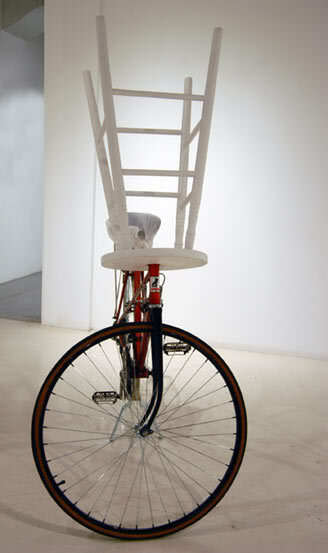 And finally: Duchamp Reloaded, by an artist who liberates "Bicycle Wheel" to experience the life of New York's streets. I’ve meant to note for the last couple of days that this is the week of the Gold Rush Randonee. My explanation of a randonee usually prompts a reaction combining puzzlement (why would someone do such a thing?) with horror (you mean people really do that without being forced?). Here’s your basic randonee: 750 miles in 90 hours, with a series of checkpoints on the way to make sure you’re moving along smartly and not taking shortcuts. You are correct. In ballpark numbers, 750 miles is a distance akin to San Francisco to Seattle. 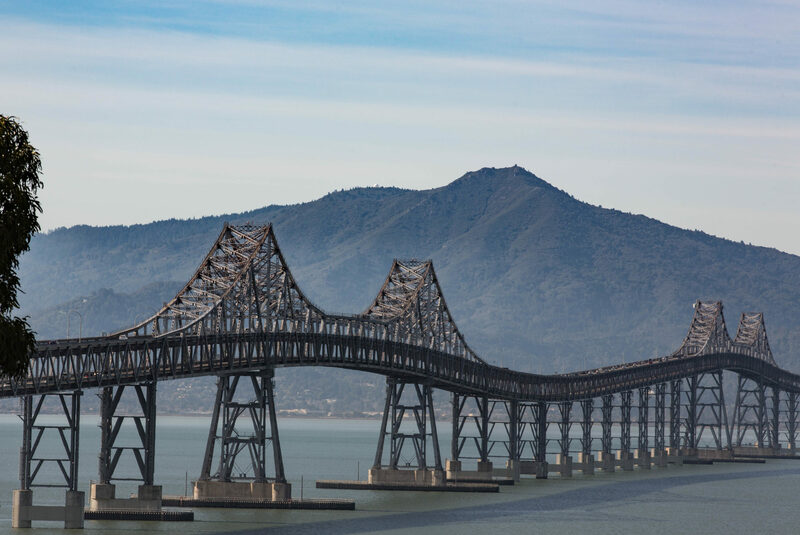 If you’re very motivated, you can probably do that drive in 13 hours up Interstate 5. On a bike, you want to build up to the adventure. Nice 50-mile increments would be pleasant. Take a couple of weeks to enjoy the scenery. Or maybe you’re a cycling animal and you do a 100 miles per diem, a century a day for eight days. Three and three-quarters. So to do your 750 miles in that time means pedaling a cool double-century a day. Yes, people actually do it. I can bear witness. But I won’t detour into some of the odder realities of the randonee–the night-time starts, the all-night rides, the naps in the ditches, the slow descent into an often less than coherent or rational frame of mind. I just wanted to note the Gold Rush riders are out there, toiling from Davis, at the southwestern corner of the Sacramento Valley, across mountains and high desert to Davis Creek, just below the Oregon border on U.S. 395. They left Monday at 6 p.m., and the first rider of the 117 who started will be back in Davis in two hours or so — only 54 or 55 hours on the road. I’d like to know how much that guy slept. I know several folks on the ride, and it’s been fun to follow their progress in the Davis Bike Club’s updates. My friend Bruce, who will turn 63 this August, seems to be several hours ahead of his pace four years ago. Amazing, really. Regularly unscheduled programming will continue here at Infospigot, with occasional break-ins with cycling news of cosmic significance. As a former bike rider, I still remember how to balance a two-wheeler and sometimes venture out into the world to remind myself what it feels like to roll along the local pavements. This morning I had an appointment over on Solano Avenue, a couple miles from home. I rode over. Then afterward, I rode up Solano and wound my way into the hills. Just to remind myself what that uphill trudge feels like. I got to the top of Los Angeles Avenue, which is short and no big deal though it has a semi-steep pitch at the end. I was taking it very easy and riding in my lowest low gear. Turning uphill on Spruce, perhaps the most popular way into the hills on the north end of Berkeley, another rider appeared alongside me. He was going faster than I and was visibly fitter, too. We said hi and wished each other a good ride, and within a few seconds he was pulling away. As I got ready to turn uphill on Keith Avenue, a quiet and steepish side street, the Other Cyclist was maybe 100 feet ahead of me. I stayed in my low gear up Keith and crossed Euclid Avenue. Then I started a sort of side-step up the ridge toward Grizzly Peak Boulevard. From Keith, which has a gentle grade east of Euclid, I turned on to Bret Harte Way, which probably has a 16 or 17 percent grade (and grade is a measure of a road’s slope: 10 percent means a 10-unit vertical change for every 100 linear units; 10 feet in 100 feet, or 10 meters in 100 meters. Given my out-of-shape linebacker physique, which my legs have to carry up these hills, I regard 10 percent as pretty steep. In Berkeley, Marin Avenue climbs into the hills with gradients of roughly 20 to 30 percent, and the steepest street I’ve heard of in town is said to be 31 percent. That’s another way of saying darn near impossible for mere mortals and former bike riders). At each corner, I tried to turn uphill. The way it worked out, I alternated between steep eastbound pitches like Bret Harte Way and flatter south-trending pieces like Cragmont. And so it went, up Bret Harte Road (steep again, and different from B.H. Way), Keeler Avenue (flattish), Twain Avenue (steep), Sterling (gentle), Whitaker (steep), Miller (easy), and Stevenson, a short street that I knew topped out at Grizzly Peak. And that was as far up as I intended to go. I finished the climb and turned left on Grizzly Peak. As it happened, I was about 100 feet or so in front of the guy who had just passed me down below. We waved at each other, and I called out that he could have taken the short cut, and he laughed. It was a lovely piece of symmetry in a short ride into the hills, but the neatness of the coincidence made me want to try to account for it. So here’s some arithmetic. The corner of Keith Avenue, roughly where the Other Cyclist passed me, is at an elevation of 499 feet if online sources are to be believed. The corner where we met again is at 1,082 feet. So both of us climbed 583 feet. Now, how far did we ride in linear distance? Again using an online tool–Gmaps Pedometer, which you ought to try if you haven’t already–my ride was 1.21 miles. His: 2.47. That’s another neat coincidence: His route being twice as long and the net climb being the same, his net grade (4.5 percent) is half of mine (9.2 percent). He also had to maintain an average speed roughly double mine, which would have been no problem since I was probably poking along at about 5 mph or less when the road got steep. So those are the numbers. Interesting, but they don’t quite sum up that moment of delight when I saw the Other Rider again. Don’t go out for your first real bike ride in months and try to go hard. Just don’t do it. But if you do, don’t let your heart rate go into the red zone. Red zone meaning you’re not sure whether you’re heart’s really supposed to beat that fast. But if you do find yourself looking at that high heart rate, don’t engage in hijinks like trying to show the other guys how fast you can go — even for just a couple minutes, which is really all your atrophied legs have in them. But if you do start showing off, don’t let anyone talk you into taking the hard climb back home when there’s an easier one you know you really should take. But if you do let reason be overruled, don’t ride out ahead of the other guys, even if you’re telling them you’re just warming up for the hard part of the climb (note: it’s all hard). But if you do go off the front a little, don’t lose track of where your friends are. They might take a turn you weren’t expecting. But if you do get separated, don’t waste a lot of time looking for them, and don’t hesitate to take easy bail-out route back home you had in mind instead of trying to push yourself up the wall in front of you. But if you do look for them, and if you do try the wall, don’t get off your bike, whatever you do. But if the damned hill is just too hard for you in your broken-down state — OK, get off. And if you do, take a look around at all the stuff you’d miss if you were just grinding your way up the grade. When you get back on your bike, and finally hit the top of the hill, you’ll be amazed that you ever thought it was hard. Don’t tell anyone it was.